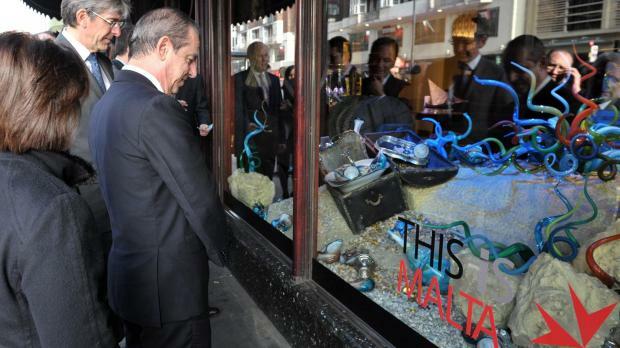 Prime Minister Lawrence Gonzi was this afternoon given a tour of London's famous department store Harrods which has this month been adorned from head to toe with touristic promotion about Malta. Dr Gonzi, accompanied by his wife Kate Gonzi, Tourism Minister Mario de Marco, Maltese High Commissioner Joe Zammit Tabona, and several other officials, was highly impressed with the showcase. A spokesman for Harrods told timesofmalta.com that although several countries had been exhibited at Harrods before, Malta's exhibition was one of their most extensive so far. All the shop windows on the famously busy Brompton Road are covered in high resolution images showcasing Malta as a high-end touristic destination. Four windows were taken a step further -- decorated, by Harrods world-renowned designers, to look like a sunken galleon. Attracting most attention was the window dedicated to Mdina glass where colourful artefacts were used to create a stunning seabed covered with treasure. Maltese flags hang from the building's facade and shoppers stepping into the huge complex were bombarded by posters, projections, digital images and several other installations. Adverts also featured on some lifts and Harrods' three old-style buses. There was also a small exhibit of Maltese artwork and a replica of the George Cross at Harrods' Georgian restaurant. The showcase is expected to be seen by some 1.2 million Harrods shoppers throughout March, as well as the countless people who walk and drive by the London landmark each day. The campaign aims to attract high-end tourists to Malta, depicting it as a destination rich in culture, history and luxury – as seen with the promotion of yachting. Earlier today, Dr Gonzi had lunch with the Ernst & Young UK senior partners were he pitched Malta as a financial centre. He listed Malta's achievements in the sector and spoke of its investment in a life sciences park aimed at sustaining the "pharmaceutical cluster" developing in Malta. "We have achieved a lot over the years. The challenge now is to sustain this growth and success... My government places financial services at the heart of its economic strategy. Ours is a long-term and consistent strategy which aims to be a success story for everyone: the practitioners, the investors and the country." Dr Gonzi will tonight dine at Harrods' Georgian restaurant where he will give a short speech to other business leaders and potential investors.